The South American trading bloc Mercosur has threatened to suspend Venezuela if it does not comply with a series of trade and human rights rules. Paraguay's foreign minister said demands included protecting human rights and enacting a law guaranteeing free movement of Mercosur citizens. The group set a deadline of 1 December. The four original Mercosur members - Brazil, Argentina, Paraguay and Uruguay - blocked Venezuela from assuming the rotating presidency in June. Venezuela's Foreign Minister, Delcy Rodriguez, tweeted that the country rejected the announcement and that the other countries were trying to destroy Mercosur. She said the bloc was supposed to make decisions by consensus. Meanwhile Venezuela is hosting more than 100 nations at a meeting of "non-aligned" countries - those who did not back either the US or the Soviet Union during the Cold War. 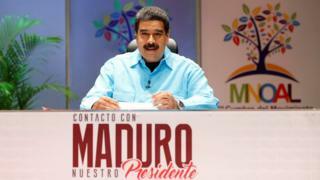 President Nicolas Maduro said on his TV programme on Tuesday that the start of the summit would "stay in the annals of Venezuelan diplomacy for centuries to come". Venezuela will take on the rotating presidency of the Non-Aligned Movement, which has been held by Iran since 2012. Viewpoint: Is the Non-Aligned Movement relevant today?